Above is the tree-stump tombstone of James and Mary Sears, another example of one of many designs found in the tree-stump tombstone motif. 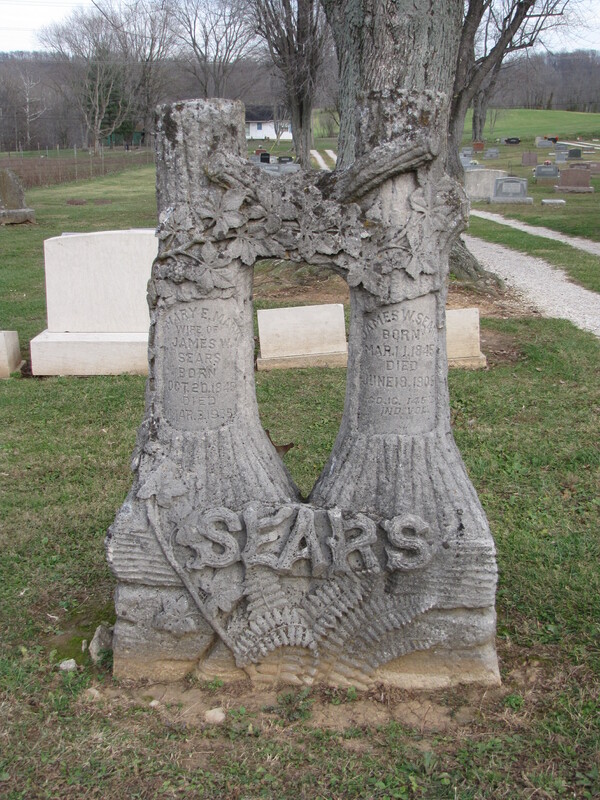 Their marker displays the name “SEARS” at the base to look like the letters were put together from tree branches. In the bottom of the gravestone ferns cluster at the base. Ferns represent humility, frankness, and sincerity. In this example they also add to the country feel of this tree-stump tombstone. Grape clusters, which represent the blood of Christ, and grape leaves grow at the top of the marker where the two halves come together with two limbs like arms twining around each other like a lover’s embrace, representing the love and marriage of the deceased couple.